Gone are the days when high protein diets were purely marketed for athletes and bodybuilders. An increasing number of Australians are adopting the high protein, low carb lifestyle. However many are still under the impression that -low carb' equals -bland and tasteless'. Busting this myth, The Protein Bread Co has launched a high protein, low carb, gluten-free range of healthy baking mixes that are guilt-free. Made from natural, predominantly Australian ingredients, The Protein Bread Co is introducing the public to a healthy alternative that does not compromise on taste. I used Almond Milk and added fresh blueberries and strawberries to the mix to create delicious fluffy, low-carb muffins that actually looked like muffins (they looked like the were bought from a cafe, if I do say so myself)! Previously I was forever experimenting with protein muffin recipes and ending up with a flat, hard circle 'muffins" - never again! The Protein Bread Co Protein Muffins, I made, were gone within 24 hours which is an indication of how good they are but also disappointing because I only got to eat two… and probably could have eaten all 10 of them. Easy, healthy, delicious and fresh: I honestly can't think of anything else better! In recent times, bread has been shamed and vilified as food that should be avoided. In an attempt to remove the stigma and ensure bread lovers get their fix, brother and sister duo Anna and Luke Hopkins decided to formulate a product that could meet dietary needs in a quick and convenient way. Succeeding in their venture, the siblings created a protein bread mix that contained a mere 1.6g of carbs per serve and a whopping 15g of protein. A wholesome and nutritious option, the gluten-free mix is naturally high in fibre and is a perfect alternative to other products currently available in the market. With a range that extends beyond bread, The Protein Bread Co has produced a range of tasty, convenient savoury and sweet mixes that are packed with nutrition and clean ingredients. The mixes include: 6 Australian Seeds Protein Bread, Protein Pizza Bases, Protein Pancakes and Protein Muffin (Sweet and Savoury). The challenges of modern day living can mean that many consumers do not realise how good their body can feel. 'Maintaining a healthy lifestyle can be difficult initially, and people often rebel against the idea of eliminating carbs because it feels near impossible. When creating The Protein Bread Co, our goal was to create a versatile range that could make low carb eating less overwhelming and more achievable for everyone," says Luke Hopkins, co-founder of The Protein Bread Co.
To suit the needs of busy lifestyles, the products are packaged for convenience and remove the complications usually linked to low carb eating. They seamlessly blend into the consumer's lifestyle and simplify the cooking process with its basic mix, pour and bake instructions. Passionate about using Australian sourced ingredients, The Protein Bread Co utilises a network of farmers Australia wide. The products' ingredients are exported straight from the farm such as golden flax meal grown in southwest VIC, almond meal from Renmark in SA, lupin from Irwin Valley in WA and whey protein from Warrnambool in VIC. Motivated by the idea of creating a positive impact on customers' lives. The Protein Bread Co is determined to make the low carb lifestyle an easy and fun experience the whole family can enjoy. The Protein Bread Co products are available at leading health and fitness stores and online. 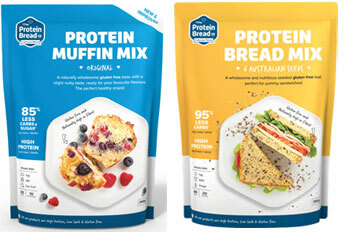 RRP is $13.00 each for Protein Bread, 6 Australian Seeds Protein Bread, Protein Pizza Bases, Protein Pancakes and Protein Muffin (Sweet and Savoury).